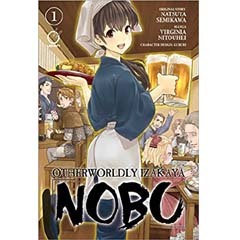 A Japanese style pub called “Nobu” exists in a back alley of the fictional medieval European city of Eiteriach. Its customers? A pair of slacker soldiers, a spoiled heiress, an uptight tax collector, and more... When the citizens of this strange world sit down to enjoy some unfamiliar Japanese cuisine, their troubles simply melt away… The curtain rises on this otherworldly eatery and the gourmet fantasy about to unfold within!